Calculating the recombination factor of four point genetic cross? 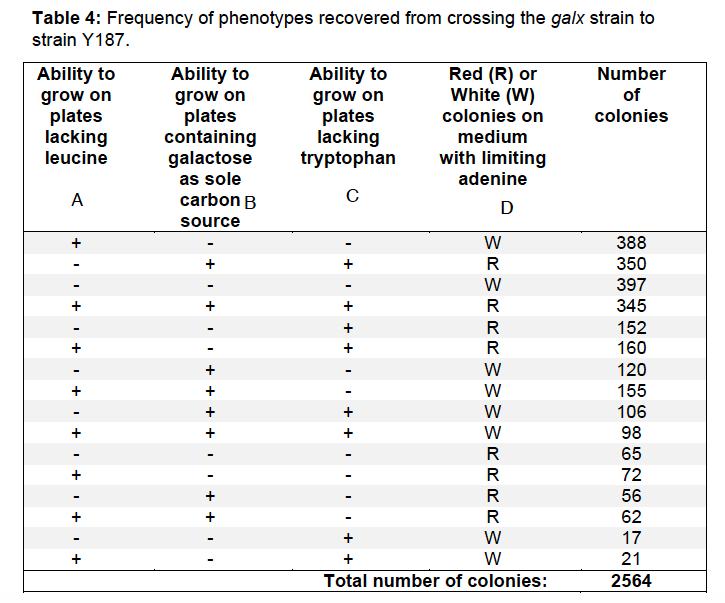 So, I'm trying to work out the recombination factor (RF) from this set of data: Which shows the 16 phenotypes of progeny of a cross of Saccharomyces cerevisiae yeast. I know how to go about a three point cross...Usually I would be able to choose from the most number of offspring showing a certain combination of phenotypes to be the Parental types and then match the others accordingly to get the RF...I want to choose the all wild-type/ all recessive genotypes. However, in this case, I'm not sure how to decide which are the parental types? What is the recombination factor between each pair of genes? Please can someone point me in the right direction, thanks! Browse other questions tagged genetics homework recombination recombinant or ask your own question. What is the point of being selection-free? Does recombination increase the additive genetic variance for fitness? Mendelian genetics - How can we infer the number of genes in play in this scenario?